When recruiters look to engage with students from business schools, they’re often obstructed by several factors, most come ones being location, time and budget. Aiming to bridge the existing gap among employers and MBA students, the Global Career Forum offers just that – a virtual event where employers and business graduate students can network and interact. Why does your company need to participate? The Global Career Forum will allow your company to access a world-wide database of MBAs with great potentials that will ensure the growth and success of any organization that hires them. Your company will get to recruit the best of the best regardless of distance. Since everything happens online, you can get your ideal candidate (even if they are halfway across the world). 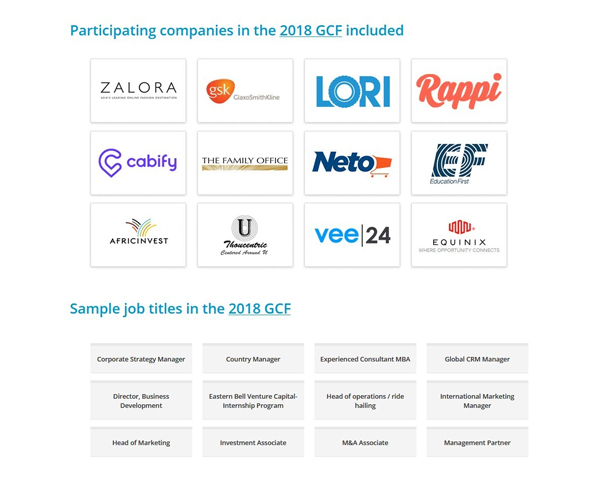 Your company will get to advertise available positions, hold interviews and hire one or more talented MBA students, without having to utilize a lot of resources since participation at the Global Career Forum is FREE for employers. The whole process leads to the final employment of your preferred candidate and requires just a little bit more than an internet connection. The Forum is run by a team of dedicated and experienced professionals who will make everything as efficient and effective as possible so you can identify the best candidates for your company. Is the Global Career Forum for you? It is open to all organizations ranging from high growth companies to professional services and financial services firms to well-funded or profitable start-ups. - We will connect with you to confirm your participation and answer any questions that you might have. - We will prepare and promote your company profile. - We will then upload your jobs that will attract the suitable candidate for your company. You will be able to review the applications and search the resume database, interview the selected candidates and hire the best candidate(s) for your company. The Global Career Forum will be held in February 2019, engaging the candidates in real-time takes just 30 minutes and can be done at your convenience during anytime in February; recruitment really is as easy as it should be. Book your slot! A lot of really talented MBA students have no idea what sort of career they really want, but once we bridge the gap between employers and future employees, the career choices are more apparent and students can make the best choices and pursue the careers best suited for them. If your company needs to recruit as soon as possible or requires a very specific type of candidate, you can contact us, and we will post your jobs immediately so you can identify your ideal candidates. We understand your needs, and will accommodate your special request. Last year’s event was a major success as some of the biggest companies like Amazon, JP Morgan, Nike, Huawei, Google, Roivant Sciences, and many more attended the event. Some of the job posts available were Corporate Strategy Manager, Country Manager, Investment Associate, Management Partner, Head of Marketing, and more.